I told you about Project Summer, but I haven’t given you any updates. The boys just wrapped up a week of Vacation Bible School at our church and we have had a lot of friends visiting and several birthday parties to attend, I haven’t had much time to post. I don’t think the boys have slept at home more than a handful of times the entire summer because they have been too busy having sleepovers with their grandparents. I miss having them sleep at home, but I can’t exactly blame them. My parents let them sleep in however late they want and David’s parents get them donuts every time they sleep over so there is absolutely no incentive to sleep at home where we make them get up early and take out the trash (oh, and did I mention that both sets of grandparents have a pool? Why would they ever want to come home?). We have already made several new dishes with varying degrees of success and I have been stockpiling ideas for recipes to make with them (this is the excuse I gave David when I bought three new cookbooks last week – this is also why the lovely people who work at at Barnes and Noble love me). Finding recipes that the boys will actually want to make has become slightly more complicated since David and I both cut refined sugars completely out of our diet for the month and all the boys really want to make are cookies, cakes and hot fudge sundaes. I have a few tricks up my sleeve though and I think I have some recipes that will be a hit despite their lack of sugar. 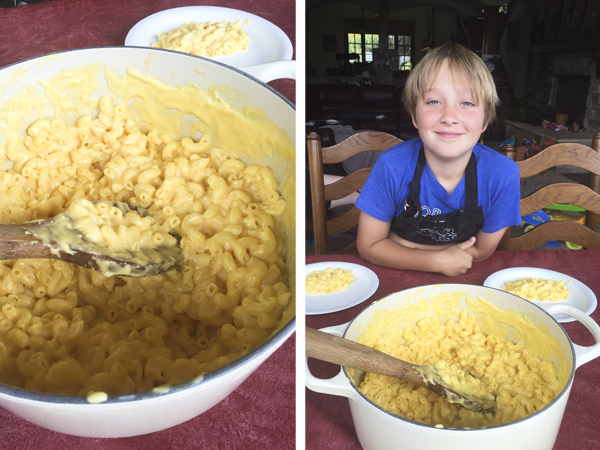 One of the first recipes the boys wanted to make this summer was Macaroni and Cheese. We ended up making it on a day that Little Man wasn’t feeling well and was refusing to eat anything other than pasta. That is when Big Guy had the idea to make “real” macaroni and cheese and not the boxed stuff. 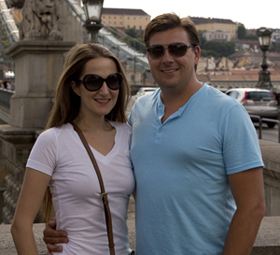 Since we had (almost) everything we needed without having to make a run to the store, we gave it a go. The results were fantastic but the best part of the experience was how proud Big Guy was of himself (and rightly so). He did everything by himself while I supervised. I was impressed by how well he followed direction and how careful he was in doing each step. He’s such a good little chef. 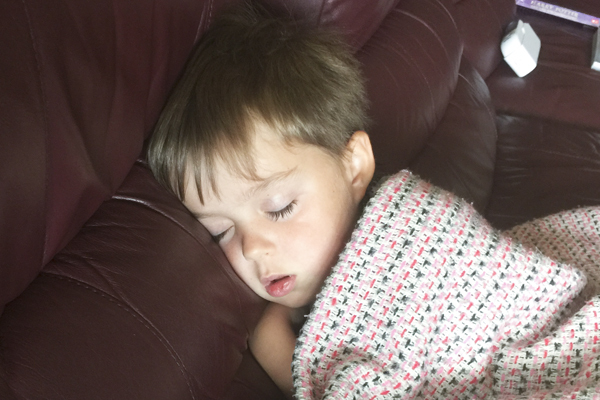 Little man was sound asleep on Nana’s couch while Big Guy made his lunch. Cook macaroni according to package directions until al dente. While the macaroni is cooking, beat the egg in a small bowl. In a large cast iron pot, melt the butter over medium heat. Add the flour and whisk together with the butter, continuing to stir constantly for about three minutes. Slowly pour the milk into the flour and butter mixture, whisking continually for about five minute or until it has thickened, making sure that there are no clumps. Temper the beaten egg with a small amount of the sauce (slowly add about ¼ to ½ cup of the sauce to the beaten egg, mixing quickly to keep the egg from curdling) and add mix the egg mixture into the sauce and stir to combine. Add cheese, dry mustard and turmeric and whisk until smooth. Add salt and pepper to taste (We didn’t add any because Big Guy felt that the sharp cheddar and spices gave it enough flavor). Drain the cooked macaroni and add to the sauce. **you can omit the whipping cream and use an additional ½ cup of milk (this is how it was in the original recipe), but we only had two cups of milk left in the refrigerator, so we had to sub the whipping cream and it turned out so incredibly creamy that we decided that we like making it that way.